Most of us can agree that there’s nothing better than sitting down to a big, juicy steak and some creamy mashed potatoes. Most of us can also agree that doing that regularly wouldn’t be best for our health or our waistlines. When it comes to choosing steak, cook a lean cut like sirloin, and trim off any visible fat. This way, you get the taste and protein you want, without all the calories. For a low-carbohydrate, low-calorie alternative, try mashed cauliflower! 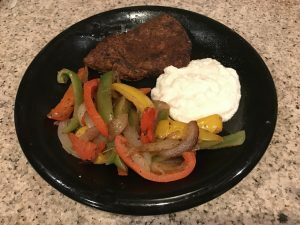 I sautéed some peppers and onions in the pan with the remaining steak juices to add some color to the plate. Thaw steak in warm water for 10-15 minutes. Combine all the spices for the steak. Dredge the sirloin in the spice mixture. Saute the steak over high heat for three minutes on each side. Add an addition five minutes for a medium-well steak. Steam the cauliflower until soft. Puree cauliflower in a blender with Greek yogurt, parmesan, and spices.